Autonomous Cars Market sales were estimated to be over 24 million units in 2017. The market is anticipated to grow at a CAGR of over 14% during the forecast period. The autonomous cars market is propelled by the supportive government initiatives and policies for the self-driving technology. The government authorities are collaborating with automotive developers to accelerate innovations in the autonomous vehicle landscape. In 2016, the UK government launched the UK Autodrive project, which is a separate group currently testing automated car systems. The project is jointly funded by the government and auto industry leaders. Moreover, the growing concerns about safety among regulatory bodies and customers to safeguard vehicles and passengers will also drive the market. Moreover, the intensive R&D activities for the development of self-driving technology and rising investment in the auto-tech also promotes the growth of autonomous cars market. The tech giants and automotive manufacturers are investing excessively in the technology to accelerate the development of autonomous cars. An exponential growth in the technologies empowering self-driving vehicles is outpacing the existing regulatory framework. The regulators are unable to keep pace with the evolution of the self-driving technology. As a result, the gap between the autonomous technology and the regulatory framework is consistently widening. 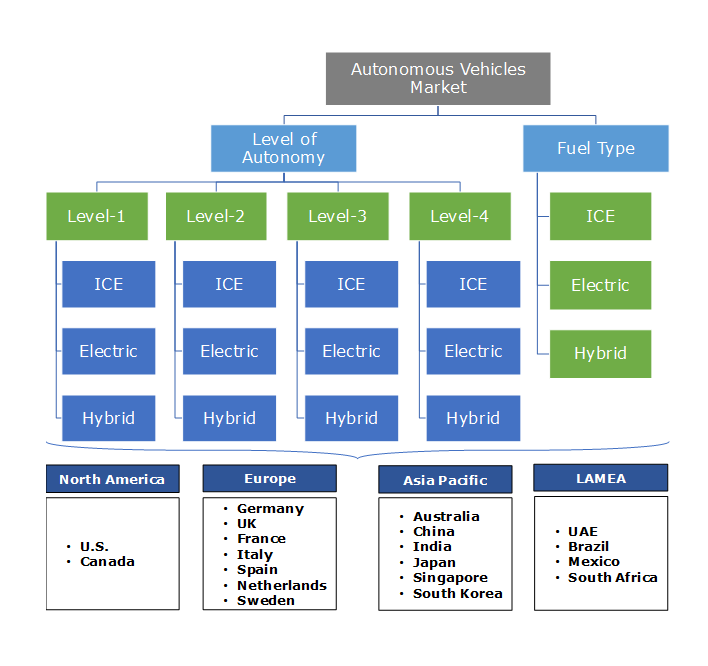 Internal Combustion Engine (ICE) vehicles are dominating the autonomous cars market with a market share of over 95% in 2017. The market growth is attributed to the high demand for ICE vehicles in developing countries such as Brazil, Russia, and India. The lack of infrastructure for electric vehicles in the developing countries also supports the demand for the ICE vehicles market. However, the increasing concerns toward environmental health and government initiatives and efforts to reduce the carbon dioxide emissions hinder the demand for the ICE vehicles. The Battery Electric Vehicles (BEV) market is projected to grow at a CAGR of over 40% during the forecast timeline. The supportive government initiatives and programs such as subsidies and tax benefits for electric vehicle manufacturers promote the development of the market. Furthermore, developments in electric vehicle batteries also augment the market growth. Level-1 cars account for more than 90% stake in the autonomous cars market. This market is driven by the increasing vehicle safety concerns across the globe. The government across the regions are constantly working on enhancing the safety of the vehicles by mandating the use of Advanced Driving Assistance Systems (ADAS) in the vehicles. For instance, European Union’s New Car Assessment Program (NCAP) is promoting the use of the ADAS systems into the vehicle to ensure safety. Similarly, the U.S. has established the National Highway Traffic Safety Administration (NHTSA), which has introduced new guidance systems for Automated Driving Systems (ADS). This has driven various automakers to roll out their own level 1 semi-autonomous solutions built-in within their automobile. Level-4 vehicles are still in the research phase and projected to be commercially available in the market by 2022. The increasing research & development activities in the self-driving technology space drive the market growth. The auto manufacturers have raised their R&D spending for intensifying their efforts for launching level-4 autonomous vehicles. These companies are collaborating with technology players and semiconductor equipment providers for the mass production of the autonomous vehicles. Furthermore, the companies are also acquiring licenses from various city authorities to conduct the testing of their self-driving vehicles. 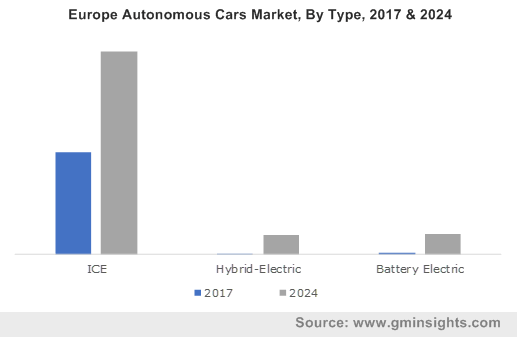 Europe is leading the autonomous cars market with a stake of over 40% in 2017. The extensive investments by automotive manufacturers in the auto-technology are primarily supporting the market growth. The supportive government initiatives also act as a major driver for autonomous vehicles in the region. The government in the region are investing in developing their road & telecom infrastructure to help autonomous vehicles to communicate with their surrounding environments in a better manner. Several EU countries including Germany and the UK have issued regulations to govern the testing of autonomous vehicles on public roads. Asia Pacific market is anticipated to attain an annual growth rate of over 15% during the forecast period. The market is driven by the increasing efforts by Chinese players for the development of self-driving technology. The Chinese tech-giants are investing heavily in autonomous vehicle technology. For instance, in 2017, Baidu has announced an investment of USD 1,500 million on driverless car projects over the next three years to accelerate research & development activities. Moreover, the Chinese government is also working intensively to gain a competitive edge in the self-driving vehicle technology. The government has allowed autonomous car testing on its public roads under certain conditions. They are also evaluating the German laws on autonomous vehicles to design a regulatory framework for self-driving vehicles. The key players in the autonomous car market are Waymo, Aptiv, Autoliv, Baidu, BMW, Bosch, Continental, Daimler, FCA, Ford, General Motors, Honda, Hyundai, Intel, Jaguar, Nissan, Nvidia, Subaru, Tesla, Toyota, Uber, Volkswagen, and Volvo. 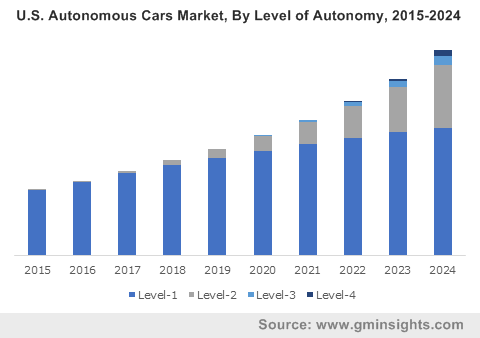 The autonomous vehicles market is highly competitive due to the presence of a large number of automotive and technology players in the market. These players are leveraging on strategic collaborations and partnerships to gain the market share and accelerate their research activities. The automotive manufacturers are collaborating with technology solutions providers and semiconductor device manufacturers to gain technical expertise and reduce the overall cost of production. Moreover, the players are investing heavily in expanding their research & development activities to accelerate the development of the self-driving technology. The path toward autonomous cars began with incremental automation features for safety and convenience before the year 2000 with cruise control and antilock braking systems. According to the National Highway Traffic Safety Administration (NHTSA), between 2010 to 2016, advanced driver assistance features such as rearview video camera, lane keeping assistance, automatic emergency braking, and collision detection emerged. Since 2016, the automation has shifted toward partial autonomy, which consists of features that help drivers stay in the lane along with adaptive cruise control technology. The automotive companies are working on launching their self-driving vehicles over the next three to five years. They are conducting strategic acquisitions of companies working on autonomous technologies and forming partnerships with OEMs to develop new autonomous solutions. The companies operating in the market have raised their R&D spending to accelerate the innovation processes in the self-driving landscape. In 2018, Magna has announced plans by allocating over USD 300 million to develop a new autonomous technology.